Readers, we’ve created an information-packed ebook on how to teach your children about money. It’s a guidebook for parents of kids at all ages. A lady I work with is paying for her daughter to go through an elite Catholic private school in the city. The other day at lunch she was telling me how stressed her and her husband were about now discussing paying for post secondary education. Apparently the daughter announced that she was looking more closely at an expensive university in our nations capital, tens of thousands of kilometers away. The parents assumed she’d always stay close to home and live with them until university was finished, moving was never in the question. I tried to remind her that she could still potentially get scholarships (she’s only in grade 11) or, worst case, get a student loan. Mom was appalled I had even suggested a loan. When I asked why, she said it was her ”duty” as a mother to provide 100% for her child, all education included. She would work full-time until she was 80 if it meant that her kid finished any and all post secondary debt-free. This, after paying $12,000 per year for the last 12 years for the private school. While I agree that yes, it is a parents responsibility to provide for their child to the best of their abilities I am of the opinion that private school is a luxury and if my child choose to pursue a post secondary education beyond what my husband and I could help her with, then she’d be on her own to figure out the difference. Arguable that she would get a better education and have a much more ”fun” time while in school since private schools have opportunities that public schools may not. However, both my husband and I, along with many of our friends who attended pubic school, had a very positive experience and many of us are quite successful. I have to wonder if, with our daughter growing up in an environment catered to nurturing her education, she would gain that much more in educational experience? There’s the $12,000++ tuition every year for private school that, while a tax deduction for us parents, in my opinion may be much better used invested for post secondary opportunities (FYI: we already save monthly in a registered investment savings for post secondary for her). We could use the $1,000/month in many beneficial ways for our daughter in terms of extracurricular activities, travel, educational experiences as a family rather than for one member of the family. Could be argued that if she is successful in private school, she may have more scholarship opportunities, combined with the arguable better education, may not need any savings from mom and dad. Both private schools in the city are pretty far from where we would ever live and we’d need to deal with the expense of getting her to school everyday (gas, bridge tolls etc) in today’s dollars, based on our current location, would cost about $100 more per month in travel. I’m leaning more towards public school and allocating a large portion of ”would be private school money” to other things for kiddo. We couldn’t afford private school as well as many extracurricular activities. Both my husband and I will be very involved with her schooling, there’s no doubt she will be successful wherever she goes but we need to do what’s best for the family. If we have more than one child we certainly couldn’t afford two kids in private school, which is a whole other issue. 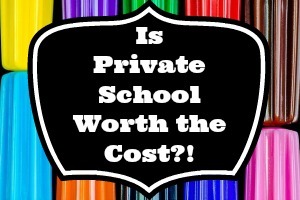 Did you/will your kids go to private school? Was it ”worth” it? I had zero financial help when it came to post secondary and I don’t blame my mom at all. Our children didn’t ask to be born so it is our responsibility as parents to provide for them and make sure their needs are taken care of, as far as I am concerned, it is not the responsibility of the parent to pay for post secondary education. However, if you’re in a financial situation that allows it, you may want to help. We are currently setting aside a little bit of money each month for our daughter because we’re able to. My mom, though she had a good job, was a single parent and many other financial responsibilities. Though we are setting aside a bit of money for her (including any financial gifts she may get) I will not jeopardize my retirement or other financial goals so she can get a degree debt free. I know of many people who have remortgaged their house, taken out of their own retirement funds just to ensure their kids have no debt when they graduate. This is crazy to me. Kids who go into post secondary ideally will get a job that allows them to repay any debt they borrowed. Though it will take another three and half years for us to be debt free we are 100% doing it on our own and I have zero resentment to my mom for not helping me. I chose to further my education and opted to do two degrees, not her. At 18 I was making my own decisions. If you do want to contribute to your kids education, start early. We opened an account for her before she was three months old and continue to contribute monthly. We made it quite clear that, especially when she is young, we didn’t need many gifts for her. We would rather have the money for her savings than another teddy bear. This helps beef up her savings and limiting the clutter in our home! Double win. It is my hope that like both me and her father, come 16 our daughter will be able to balance a part-time job, school and extracurricular activities (though if she can’t job is first thing to go). It is important that we teach her the importance of saving and plan to match any savings she comes up with on her own (to a max we will decide when the time comes). I think this will encourage good saving behaviour, which hopefully will last a lifetime and allow us to reward her for a good behaviour. Saving money isn’t easy and I’m hopeful this will encourage her. Though I have no intentions of giving up anything I want in my life her post secondary savings (I would gladly give up anything for something she needed) you’d be surprised how easy it is to find even $25 per month. 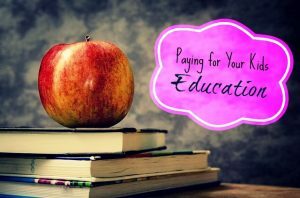 Over 18 years, while it won’t pay for a degree, it will certainly help offset some post secondary costs and your child will appreciate it! Do you save for your kids post secondary? Will you pay for all of it no matter what?